Have you ever tried scotch eggs? They’re an interesting creation that is popular over in the UK and you can often find them in the US at Renaissance Festivals. I guess they are considered some kind of Medieval finger food. In a nutshell, they’re usually a hard boiled egg that is wrapped in ground sausage then rolled in breadcrumbs and fried. Kind of like a fried meatball with an egg inside. They’re actually pretty tasty with the pork and spices, and you usually get them with some kind of dipping sauce. Greasy, crispy, yummy. As you can imagine though, they’re pretty loaded with fat and calories like most festival fried yummies. Yeah, that’s probably why they’re so good. The other day I got an email about the top 100 restaurants to eat at in the Dallas area. 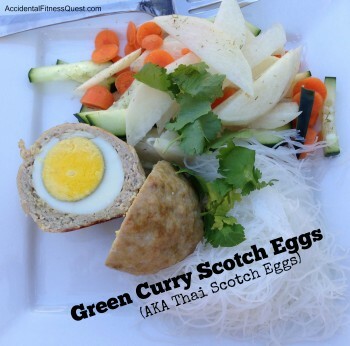 In the email was a picture of a Thai restaurant’s scotch eggs. After I finished squealing with delight and coming to grips with the fact that the frou frou restaurant was out of my price range, I said to myself “Heck, I can do that!” So I did. Quick and painless and a whole lot cheaper than hitting an upscale restaurant. I also left out the breading and baked them instead of frying so that the calories were reasonable. Hard boil your eggs and let them cool until they can be handled safely. Peel the eggs and set aside. Preheat your oven to 400 degrees and line a cookie sheet with foil. In a bowl, mix the ground pork, curry paste and lemongrass until combined. Divide the pork mixture into four equal pieces. Flatten each piece in the palm of your hand almost like you were making a thin hamburger. Place an egg in the center and press the pork mixture evenly around the egg, making sure to cover the egg completely. Repeat with the remaining three eggs. Place the eggs on the cookie sheet and bake at 400 degrees for 30 minutes until the pork is cooked thoroughly. Remove from oven and serve with sriracha, green curry mayo or other dipping sauce. Makes 4 scotch eggs at approximately 132 calories – 24g protein and 4g fat. The Kid and I had them the first night with a green curry dipping sauce which was basically mayo mixed with green curry paste. I made a quick salad with carrots, cucumbers, daikon radish, and cilantro and tossed it with rice vinegar, lime juice, and sesame oil to go with the Asian theme. I also threw together some rice noodles.